What on earth could be “smart” about a doorbell? You press it and it makes a noise, end of story, right? Wrong. In this day and age, home automation is putting tech into every appliance you can think of, with cameras, motion detectors and the like being the obvious culprits. However, it has reached more mundane devices like doorbells as well, bringing a level of convenience and functionality you didn’t even know was needed. Why bother with pesky wiring when your doorbell can connect to the home wi-fi network? Why bother with a peephole when your bell is equipped with a camera? All kinds of features can be packed into smart doorbells which truly make them a well earned part of any smart home automation system. Smart doorbells typically come in two varieties, those with battery operated receivers and those with plug-in receivers. The advantages and drawbacks are clear: battery operated receivers can be placed anywhere, but you’ll need to buy and replace batteries every now and then. The plug-in receiver is restricted to an outlet, but while plugged in, requires no further attention. A newer development in the industry is the doorbell without a receiver entirely. These connect to your smartphone via an application, meaning if the doorbell is pressed, the phone will notify you. Most of these models come with additional functions, like cameras and a PA system, which bring with them the obvious advantage of being able to deal with situations away from home. If you get a delivery when out and about, just talk to the delivery guy through your phone/doorbell and ask them to come back a bit later. Naturally, the issue here is that when your phone’s battery dies, technically your doorbell no longer performs its function. Features to look for in smart doorbells include cameras, audio systems and expandability. The main specification to watch out for is range, though generally you won’t be needing massive operating ranges unless your house is situated a long way from the gates of your property. In terms of price, there is a pretty big discrepancy in the different categories. Basic functionality smart doorbells generally fall into the $10-30 range, while those loaded with more features are more in the $200 ballpark, with barely anything in between. The price differences in the lower category can generally be attributed to construction quality rather than a difference in features and functions. We’ll be looking at bells from both price categories in this guide, working our way from cheapest to most expensive. Moving on to the expensive, high-end products, we have the RemoBell up first which rolls together all the better features of the previous devices while adding a whole lot more. While the regular wireless doorbells we’ve looked at before make things more comfortable and convenient, the RemoBell is where these devices start to earn their “smart” moniker. Instead of being a button and receiver combo, the RemoBell is a single device which acts as the button for the doorbell, and the receiver’s place is taken over by your smartphone. Instead of connecting to a physical receiver hub, the RemoBell is linked to an application and “rings” via push notifications. 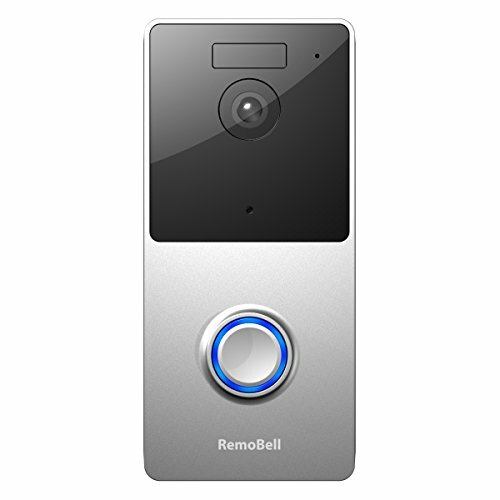 As a truly smart doorbell, the main feature of the RemoBell is its versatility. A camera, 2-way audio system and motion detector have all been crammed into this doorbell, allowing you to check on who’s ringing, save video if the motion detector is tripped and have a conversation with your visitor at a distance if you’re not at home (or stuck in the bathroom after a hearty dinner with spicy meals for that matter!). You can ‘answer’ your door even if you’re on the other side of the planet so long as you’re connected to the internet. The camera built into the RemoBell provides crisp 720p HD footage which can be tracked via a timeline of events in the application. The app also sorts recorded videos into chronological order offering playback. The motion detector built into the device is an IR sensor which, based on body-heat, can differentiate between the motion of actual people and random objects, like leaves swaying in the wind. What’s more, thanks to the infrared tech, the camera has night-vision capabilities. The 2-way audio system will let you speak to whoever is ringing, which can be helpful in a number of situations. Maybe you’re not presentable, maybe you’re not at home or maybe the courier with that package you’ve been so anxious to receive just turned around to leave and you haven’t reached the door yet. The device is battery powered, which on first reading may be a turn-off for some people. However, rechargeable batteries are included in the package, and with average usage, they should last 4 months with one charge, which is really impressive. The app will notify you when the battery is getting low. If you want to hang on to your recording for security purposes, the manufacturers offer a cloud storage service. The first 30 days are free, but after that you’ll need to pay a monthly subscription fee of $3 to continue using this feature. You can’t save recordings locally or to a personal DVR unfortunately (obviously in order to boost usage of the paid storage service). The device is weatherproof, so you can safely install it wherever you wish, and the fact that it’s battery powered gives it even more mobility. Oh, and next to all that fancy tech, it actually functions as a doorbell too! The RemoBell packs all of the features that the other high-end smart doorbells do, but with a more attractive price-tag. While the cloud storage service has a monthly fee, so do the services of the other manufacturers, and at the end of the day the RemoBell offers the same – sometimes even more – for slightly less, which makes it the winner in our book. If you’re willing to drop a larger sum for a truly “smart” doorbell, this is definitely the best choice on the market today. The RemoBell is a fantastic little device with an extremely wide range of functionality with all kinds of features packed into it. The price tag is hefty, but you’re definitely getting your money’s worth with this smart doorbell. The Pro is the big brother of the Ring 2 in more ways than just price. While it does cost significantly more, it also offers a greater range of features and services from the manufacturer. Ring really sought to pack as many features as is sensible into what, at the end of the day, is still a doorbell. While all previous high-end smart doorbells relied on mobile apps, the Pro immediately distinguishes itself by offering both a mobile and a desktop app, but this is only where the bonuses begin. Here at SafeMonk, we’re a sucker for cross-compatibility, something you’ll have learned from our other buying guides. As such, the fact that the Ring Pro is compatible with Amazon Alexa is a major selling point, allowing users to integrate the device into a larger smart home infrastructure. So many devices and appliances of all types offer Alexa support that smart home enthusiasts can manage their entire house with voice commands at this point, and the Ring Pro adds the humble doorbell to that list. Beyond supporting voice commands, the Ring Pro comes with so many features that you’d easily forget we’re speaking about a doorbell. 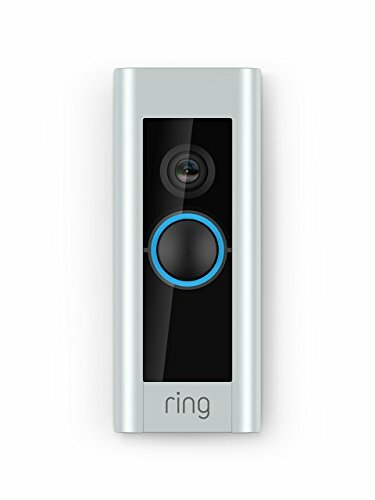 Between 1080p video recording, IR motion detection with active zones and profiles, night vision, 2-way communication, live playback and an enhanced connection range compared to the Ring 2, this is almost looking like a dedicated security system rather than the modern day incarnation of the door-knocker. Beyond these features, the device is highly weather resistant meaning you can set it up on an exterior wall without worrying about the rain killing your expensive product. Since the Ring Pro is (obviously) mounted on the outside of your home, you might be worried that it gets stolen, but worry not – it’s geolocally locked with GPS, meaning unless you authorize a change, it will only work on your house. Sure, a criminal may not know that however, which is why the manufacturer offers a lifetime theft warranty, meaning if the device is stolen, they send you a new one free of charge. One thing to note is that this device isn’t battery powered, and requires to be wired like a regular, old fashioned doorbell. Additionally the same paid storage service as the Ring 2 applies. While the Ring Pro is the most functionally impressive device we’ve reviewed, it’s also the most expensive… by a long shot. When comparing devices based on value, we just be certain that these extra functions are truly worth such a large price hike, keeping the Ring Pro from scoring first place. They might absolutely be worth it for you of course! Besides being quite the mouthful, the P4-Premium doorbell is one of the very, very few devices which licks the vast void between the $30 and $200 price points for these devices, and the list of features reflects this too. While not as high-tech as your $200 models, this device boasts a wider range of functionality than any of the others we’ve looked at so far. The receiver type is battery operated and also expandable with both additional buttons and, like in the case of the Starpoint, other compatible devices such as motion detectors and door alarms for a bare-bones home security system. Not only does this device offer expandability with various detectors and alarms, it features a small display with a set of six icons which each denote a different kind of notification. Alongside the flashing light that optionally accompanies a simple bell ring, the device will tell you whether a motion sensor has been tripped, a door has been opened, an alarm has gone off or if someone is simply ringing your doorbell. These icons are complemented with 6 programmable chimes, each unique to one of the paired devices. One small catch is that you can only pair up to 6 devices with one receiver, which is significantly less than some of the competition. When you have so many devices communicating wirelessly with one another in a world with so much ambient interference, especially in densely populated areas where everyone’s phone signals are bouncing all over the place, connection issues can be a real problem. The P4-Premium uses what the manufacturer calls a self-learning code system to prevent any such issues. The devices have a reputation for high quality and durability. You can expect one of these to work for 5 years and over so long as you don’t actively try to destroy it. On top of that, the buttons have really low energy needs and whereas other models might drain a battery in a month, these buttons will live off one battery for years which is a massive plus and cost-saver. The receivers have a 450ft operational range, however there are some range extending devices available which can pair with the receivers. If you don’t want to jump into the high-end market for smart doorbells but are willing to spend a little more on your solution, the Honeywell P4-Premium is likely the best choice. While not exactly a budget device it won’t break the bank either, and backs up the asking price with an impressive list of features and functions. Ring’s second generation video doorbell is the best seller on Amazon in this category, however we prefer the aforementioned RemoBell over this device. The Ring 2 is more expensive but packs fewer features and has a reputation for being less reliable. What instantly jumps out at us about the Ring 2 is that to get the best experience, you need to buy an additional device, the Ring Chime, which is an indoor chime that doubles as a Wi-fi range extender. The Ring 2’s range is rather poor and the video quality suffers for it. The Ring 2 has everything the RemoBell does, so let’s look at one thing where it comes out on top. The built in camera offers 1080p full HD footage as opposed to the 720p of the RemoBell. The recorded video is extremely high quality, putting many dedicated security cameras to shame. While the 1080p recording is all good and well, it comes with a few crutches. That quality only comes through when the connection to the Wi-Fi is excellent, and only during the day. The Ring 2 lacks night-vision functionality, even though it features a motion detector. Ring also offers a cloud storage service with a 30-day free trial, but after that, you’ll need to pay a monthly fee of $3 or a yearly fee of $30, with no option to save locally. 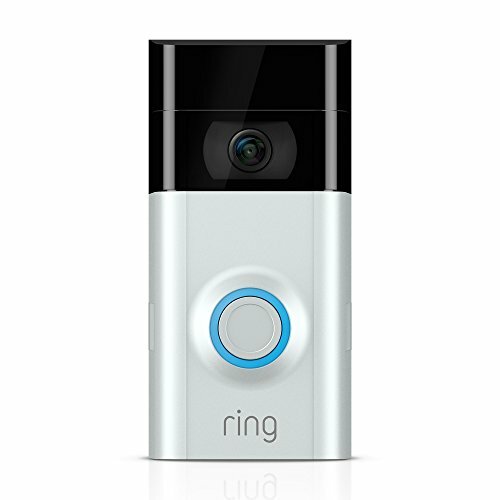 Another advantage the Ring 2 has over the Remobell is that you can optionally connect it to existing doorbell wiring, in which case it won’t require battery power and will ring the existing chime in your house. Instead of regular batteries, it comes with its own rechargeable pack and charger, however battery life is shorter than we’d ideally want. There is a 2-way communication system built in, however the quality of this also depends on the Wi-fi connection, which, as mentioned before, is heavily reliant on buying the additional chime. The Ring 2 brings its own set of strengths to the table with a high-quality camera and by letting you pick between battery power and wiring. However, some notable omissions like night vision, and the handicap of only functioning reliably if you buy another product, mean we need to urge customers to look at the competition instead. SadoTech has many smart doorbell products on the market, with the Starpoint line representing their more advanced sub-brand. It’s easy to confuse it with their regular models though, as the doorbells share the same physical appearance save for a tiny, inconspicuous star logo printed onto the plastic casings. This is important to point out because the Starpoint is marketed as being expandable, however it is only compatible with other Starpoint products, and not with other non-Starpoint SadoTech devices. 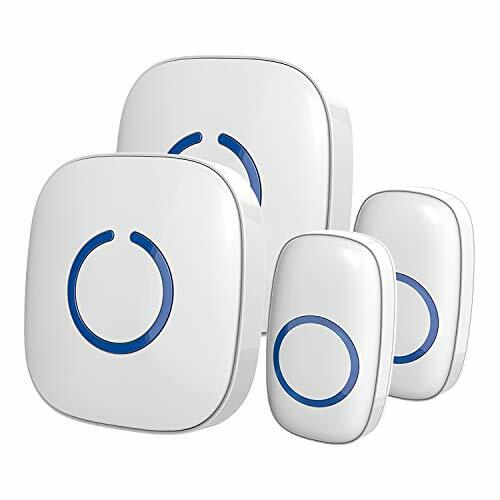 The Starpoint wireless doorbell kit features plug-in type receivers, and like the Magicfly kit, has two pairs of devices ready to be installed, a process which is simple and quick. 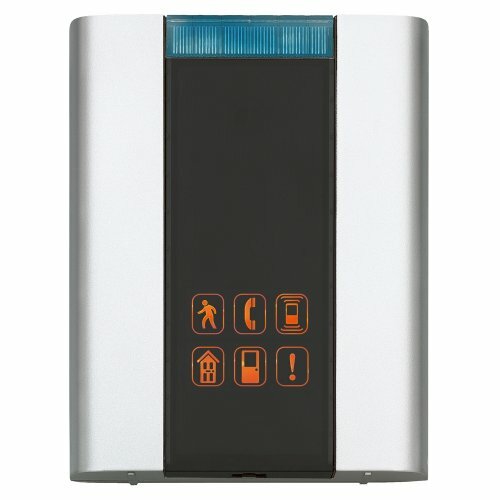 Expandability is the biggest selling point of this model, because not only can you expand the system with as many buttons or receivers as you want, but with a number of other Starpoint home security devices. 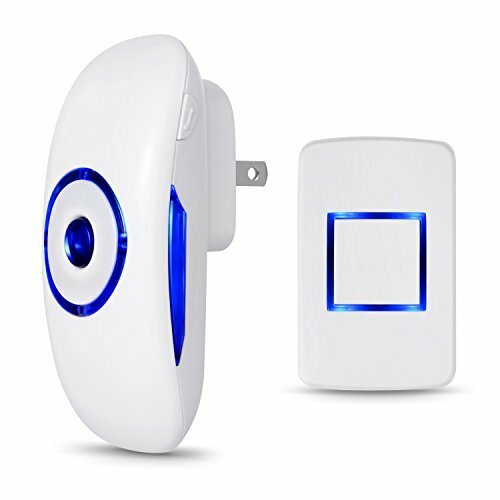 Both motion sensors and door alarms can be integrated into the network, with not only each type of device but each individual device being programmed with its own unique chime, so you instantly know which area of the house to investigate. The operational range of the Starpoint smart doorbell is 500-600ft, which isn’t the largest we’ve seen but still pretty impressive. The device has a memory feature meaning your settings and profiles for other devices connected to the receivers won’t be lost if the power goes out. The buttons are not certified as waterproof, however they are labeled as weather resistant. While a bit of rain won’t instantly brick your doorbell, you ought to make sure they’re installed in protected areas. Weather fluctuations shouldn’t do any harm so a small roof over them should do it. The Starpoint wireless doorbell kit is a great choice for someone looking into novice home automation and security structures, but who doesn’t want to invest in much pricier hardware. The benefits of this product are best experienced if you are, however, willing to invest in additional motion sensors and door alarms from the same manufacturer. 1byone clearly strove to fit a whole lot of features into this wireless door chime while keeping the price low, and without compromising quality. This model comes in two variants which have either a battery-operated receiver or a plug-in receiver, both of which are functionally identical except for how they get their power. For clarity, we’ve reviewed the battery-operated version here. 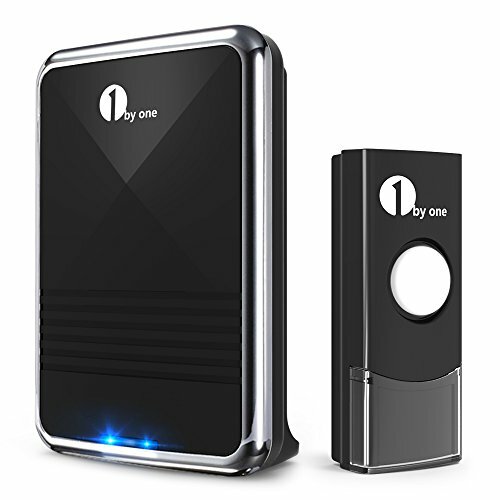 1byone’s Easy Chime is a well-built device with few malfunctions or faulty units reported. The package comes with batteries for the button included so you’ll only need to worry about the receiver when setting it up, which uses standard AA batteries. It can also be expanded with additional buttons that you can buy separately. As a battery operated device, the receiver of the Easy Chime wireless doorbell can be placed anywhere in your house, or even taken with you to whichever room you are in to ensure that you hear when someone’s ringing. This feature can be extremely handy for the hearing impaired as the receiver also has a flash setting where it gives off light signals when the doorbell is being rung. Naturally you wouldn’t be able to see this from another room. The device has a rather short range of just 300ft, however for use on a house this should be more than enough in most cases. The bell button is sturdy and waterproof meaning you can safely install it without any additional protection from the elements. A additional, neat tidbit is that the bell button has a little enclosure for a nameplate, and this is the only such product on this entire list. The system can be expanded with up to 5 buttons connecting to a single receiver, however you cannot program them to have unique chimes each. If you want things the other way around, the same button can be linked to multiple receivers which can then be placed at various points of the house. The receiver itself has 36 selectable tunes and volume can be controlled with 3 settings. Additionally, the light system mentioned before can be turned off, set to work in unison with the chime, or to be the only method of notification. For such a cheap product, 1byone’s Easy Chime wireless doorbell manages to pack a lot of useful features into an elegantly presented package, with some unique treats few others offer. You’re getting a lot of bang for your buck here, and at a high quality, so if the short range isn’t a dealbreaker, this is the best you can do in this price range. Compact Design - Place this kit's push button and receiver anywhere, and always be notified when a visitor arrives no matter where you are in the house. 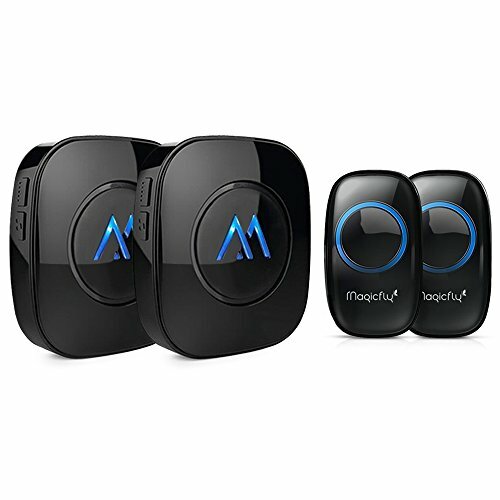 If you’re looking to replace multiple bells right off the bat, Magicfly offers a handy solution with its double doorbell kit, coming with two buttons and two receivers for the asking price that usually accompanies just a single kit. The receivers of this model are of the plug-in variety, and the installation of the buttons is really easy with double sided tape and nothing more. The product ships in good condition with exceedingly few exceptions, and malfunctions can be avoided if you’re using the device the way it should be – but keep in mind that there is a difference between the concepts of water “resistant” and water “proof”. Many customers don’t and often learn the hard way. The Magicfly wireless doorbell excels in the field of operational range, which is 1,000ft unobstructed and a tad under 700ft when there are obstacles packed in its way. While the bell button’s susceptibility to prolonged exposure to water means you won’t be wanting to install it anywhere in the open, if you have a larger property with the gate far from the house, this is an ideal choice so long as you take the necessary precautions and give the button a safe and dry “nest” of sorts. The device is certified IP33 water-resistant, meaning odd spurts of water won’t do it any harm, however any kind of sustained rainfall or storm might whack it, and don’t even think of submerging the poor thing (why would you, though?). The Magicfly wireless doorbell kit can be expanded with both further receivers and further buttons. All buttons can be connected with all receivers if you so wish, and each button can be programmed with a unique chime – of which there are 52, so you won’t run out anytime soon – letting you cover multiple entrances while using multiple receivers in different parts of the house to ensure you hear when someone’s ringing. The volume of the receivers can also be adjusted, with 4 levels. The Magicfly wireless doorbell kit offers the range of the Boomile but a higher build quality, two button/receiver pairs and additional features like expandability. While also more expensive, it isn’t by much, and if someone is looking for range above all else, we’d recommend this device over the former. Certifications: All products passed CE, FCC, RoHS approval. Boomile’s wireless doorbell is not *the* cheapest model on the market, but it is one of them. This simple device has few features, but does what it sets out to do. One issue with this model is that build quality is often hit and miss, with many users reporting their bell buttons malfunctioning rather quickly (anywhere from within days to a month). The manufacturer offers a one-year full warranty and their customer service has been praised, but it’s always better not having to jump through those hoops in the first place. Boomile’s model offers the longest operational range among all smart doorbells we’ve reviewed at 1000ft/300m. This is a good choice for users who don’t want to invest into one of the ~$200 models but have their front gates a good distance from their houses. This range has also given some resourceful users alternate ideas for use, such as setting up multiple receivers in various buildings on a large property, allowing family members to signal others when in far flung sections. The Boomile team got a little carried away with their chimes, as this doorbell features a ringtone library of 36 selectable tunes. With such a wide spread, chances are you’ll find something that doesn’t drive you up the wall when the kid starts playing with the button. In case you do happen to find every single option to be irritating, you can quiten things down with the 4 levels of adjustable volume. The button enclosure has been certified for outdoor use, but isn’t waterproof and the manufacturer suggests using the device upside-down if it’s installed without any kind of protection from the elements, in order to prevent water from leaking in. While most people don’t seem to have an issue with this, rain does tend to kill many units. Build quality is generally high, but you might need to do one round of returns since many devices ship with an odd malfunction that sees them eat through batteries within a week, which isn’t intended. Batteries are, however, included with the purchase. Boomile’s wireless doorbell doesn’t suffer from any major dealbreakers, but there are some issues that could definitely use ironing out. Nonetheless, you do get what you pay for with this product. Before jumping into the world of smart doorbells, it will save you a lot of time if you determine how much you want to spend on this investment. The large price difference between the two types means you’ll be halving the potential pool of devices. Prioritize which stats are most important – range, expandability, or something else – and pick accordingly. The spread of features among smart doorbells in the lower price point means that some aren’t categorically better than others, rather better suited to some purposes, while others are better suited for other roles.